The post has been updated to reflect which Office 365 services are available to the public roadmap and First Release customers. 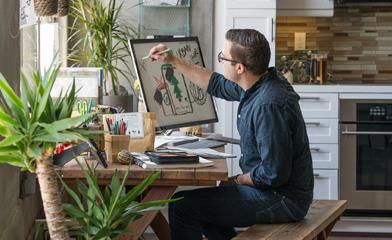 Jake Zborowski is a group product manager for Office 365. Those of you who have been following this blog have seen dozens of great improvements that we’ve shipped to Office 365 for business services over the last 18 months. In that time I’ve had the opportunity to discuss our roadmap and release processes with customers across the globe, and two major trends have become apparent to me. First, many of you are really excited about the new update cadence, specifically the ability to consume change in small chunks, our responsiveness to your feedback, and fast access to the high value of the new services and features. And second, just as we transformed our development processes, we need to transform our communication processes regarding changes and future updates to the service. We’ve been working hard on this feedback, balancing our ability to deliver high quality timely improvements to the service with your need for information. The most significant change we’re making is in how we communicate updates and provide a forward-looking view of our service plans. We’ve learned a lot from our Yammer team on how customers expect communication in a fast-paced, services world, and we got great feedback from customers like you at the SharePoint and MEC conferences on our transparency for future investments in our business services. Building on this, we decided to take the next step and communicate with you in a new way, via a public roadmap, to make sure that as many people as possible know about the exciting improvements we’re bringing to the service. Today we’re launching the Office 365 for business public roadmap. The Office 365 for business public roadmap provides you with a way to learn more about upcoming updates before the change comes to your service. It provides a few months’ view of new features, enhancements, and major updates. In some cases we may communicate farther in advance than a few months, like when we announced our long-term investments in the new service Codenamed “Oslo” and the Office Graph. We will provide visibility to planned updates that are in development and in the process of being rolled out to the service, as well as to items that have been launched and are now generally available for all eligible customers. The public roadmap will be your best source of truth for product enhancements coming to the service. In addition to the public roadmap, we are also rolling out a new program called First Release. First Release gives customers who opt-in the opportunity to get a small selection of significant enhancements to the Office 365 user experience, SharePoint Online, and Exchange Online first. If you opt-in to First Release, you will receive new qualifying feature updates first, a minimum of two weeks before customers in our standard release group. 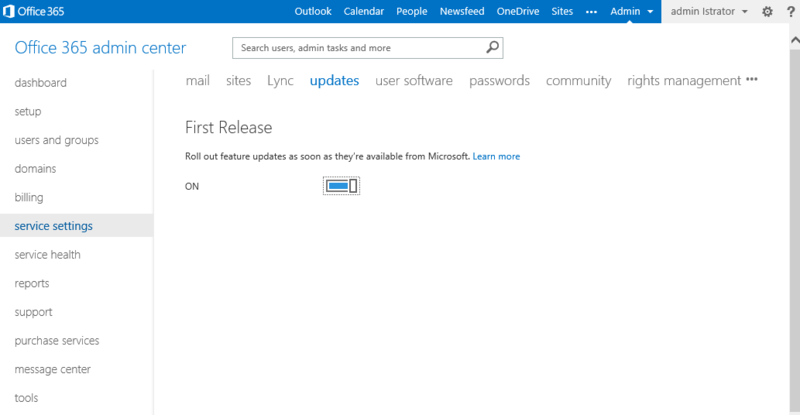 Updates to Lync Online, Exchange Online Protection, Office 365 ProPlus, or other related services are not included in the First Release program at this time. By default, all Office 365 customers are part of the standard release group. If you’re in this group, you will receive the new feature updates a minimum of two weeks after availability in First Release. The vast majority of service updates will be made available to all customers via our standard release processes. Over the past week we began the rollout of the First Release opt-in. If your organization is interested in opting into the release group, an Office 365 admin can log into the admin portal and select First Release under service settings. Go to Admin > Service settings > Updates. Here’s a live Garage series recording from TechEd in which Jeremy Chapman and I describe some of the differences between our on-premises release process and the Office 365 service updates process, provide more detail on our approach to change management, and discuss improvements we’re releasing today. These enhancements are built upon previous enhancements we have made to Message Center to improve visibility to changes impacting your service. As we announced in April, Message Center continues to evolve to better communicate service changes and updates. 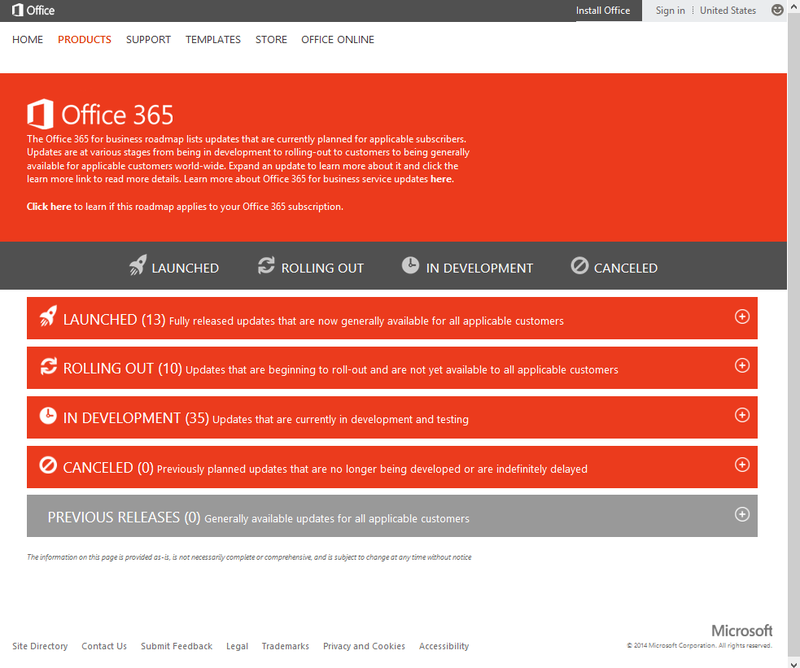 Both the Office 365 for business public roadmap and the First Release program will use the message center to notify you about updates and changes to your service. We’re excited about these service enhancements and hope they will help improve your ability to stay informed about the valuable improvements and changes we are bringing to the service. Like any feature within the service, how we communicate and the tools and programs we provide to help you manage change will improve over time. On Tuesday, June 24th the Office 365 Technical Network will host a Roadmap Communications YamJam from 9:00-10:00am PT to discuss the announcements in this blog post including, how we communicate service updates, the first release group, and Message Center. For those unfamiliar with a YamJam, it is similar to a “TweetJam” on Twitter or an “Ask Me Anything (AMA)” on Reddit, except it takes place on Yammer. It provides the opportunity for the community to ask questions and have a discussion with a panel of internal Microsoft experts on a particular topic. Request access to the Office 365 Technical Network. All requests will be approved as quickly as possible. Join the Roadmap Communications YamJam group. You can find it through by using the Browse Groups function, or through the search bar. Log in at 9:00am PT on Tuesday, June 24th to ask questions, follow the discussions, and connect with Microsoft team members. Q: Which Office 365 services will the public roadmap and First Release apply to? A: Both the public roadmap and the First Release program will apply to the commercial and Academic multi-tenant services. The roadmap and First Release do not apply to Office 365 operated by 21Vianet or Office 365 Dedicated/ITAR customers. Q: Will the public roadmap include all changes to the service? A: No. The public roadmap will provide a great view of many updates and enhancements to the service, but it will not capture every change. Q: When will the First Release opt-in be available? A: The admin opt-in for First Release started rolling out over the last week and if it is not currently in your admin center, it should be available within the next week. Q: When will we see the first update in First Release? A: Over the next month or so we will provide time for customers to opt-in and later this summer we will notify customers via the message center when the first update will be available to First Release customers. Q: Is First Release a beta program? Are updates supported? A: No First Release is not beta. All features made available to customers in First Release are fully tested and supported. Q: How many updates will I get in the First Release group? A: First Release is a small set of significant updates. The majority of updates will be delivered globally to all customers. Q: How long after I opt-in or out of First Release will it take for the setting for take effect? A: Changes to your First Release setting will take up to 24 hours to take effect. Q: Can I apply First Release to a subset of users within my tenant? A: No. First Release is a tenant-wide setting. Q: How will I know when an update is coming to First Release? A: We will notify customers via the Office 365 message center in the admin center.